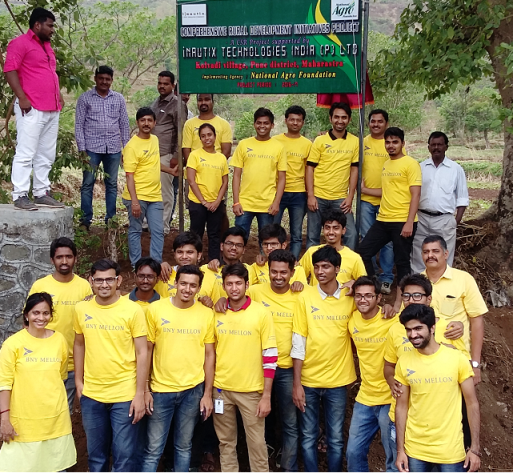 The Chennai based iNautix Technologies India - a BNY Mellon Company, has joined hands with National Agro Foundation to rehabilitate 3 villages in Kancheepuram and Thiruvallur Districts of Tamil Nadu. This project was inaugurated on June 18th 2016 at Vilambattu village in Kancheepuram District by Dr. Vidya Durai, Director – Community Partnership, iNautix Technologies in the presence of Ms. Kalpana Rajesh Additional Director, National Agro Foundation, the community members and voluneteers from iNautix. This ‘Comprehensive Rural Development Initiatives’ will bring about agriculture development, women empowerment, natural resources management, training and Capcity Building, Hygiene & Sanitation and Livelihood Support activities in the villages undertaken. The project is expected to immensely benefit the rural communities in the villages ofVilambattu, Pudupettai and VK Agaram through wide-ranging interventions to sustain their livelihoods. National Agro Foundation is a NGO extensively working for Integrated Rural Development for the past 16 years with prime focus on agriculture and watershed development. NAF is currently working in four states of India benefiting over 40,000 rural families through various grassroots interventions.